Streaming audio has always been a great source of entertainment – whether it comes in the form of Internet radio or music-on-demand. The availability of both have expanded over the years, and nowadays you can find audio streams of practically any music you could possibly desire. If you already enjoy listening to audio streams, then you have probably come across music that you wished you were able to save so that you could listen to it again – or transfer it to another device. Unfortunately audio streams tend to not provide an option for that, which is why if you want to pull it off you’ll have to rely on Movavi Screen Capture Studio. Launch Movavi Screen Capture Studio and select ‘Record Audio’ in the menu. Open the list under ‘Audio capture device’ and select the speakers or headphones that you’re using. 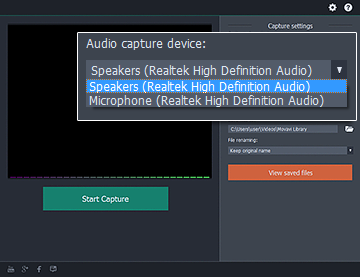 Click ‘Start Capture’ to start recording and play the audio stream at the same time. Click ‘Stop Capture’ when the song is done and it will automatically be saved to the destination specified. Before you exit Movavi Screen Capture Studio, you may want to take a moment or two and explore its other features. It has a wide range of capabilities that will let you record your screen and edit videos by cutting and combining video segments, improving the video quality, adding customizable text, inserting audio tracks, applying special effects or filters, and much more. Although most of these features tend to be oriented towards videos, some will come in handy with the audio that you recorded. In particular being able to use Movavi Screen Capture Studio to trim out any parts of the audio that aren’t required and convert the format to MP3, WAV or any other audio format may be useful. Now that you know how to record audio streams using Movavi Screen Capture Studio you should be all set. The next time you come across a song that you like from an audio stream, just fire up the software and save it so that you can listen to it later and on any device you choose.